Sonos Play:5 (2015) review | What Hi-Fi? It’s easy to forget what an important product the original Sonos Play:5 was, both for Sonos and for music streaming as a whole. Having previously focused on devices designed to connect electronics and speakers made by other companies, the Play:5 was the company’s first all-in-one unit. It was so successful that Sonos remains first and foremost a wireless speaker company today, spawning a host of rivals and competitors trying to emulate the Sonos model. But standing still is akin to going backwards in the tech world, so after six years and myriad software updates (the original is still supported today), the first Play:5 was retired and replaced by a new model. This too was a great device when it launched, but a fresh look in light of the arrival of a number of new rivals proves it’s no longer the top dog for sound quality, even if it remains the king of usability. Sonos says the idea behind the design of the current Play:5 was to create “the quintessential speaker for the digital age”, with a revamped design and the focus on flagship sound. It looks and feels different to the original, but fits in perfectly with the company’s other more recent additions, such as the One and PlayBase. Design has never been taken lightly at Sonos, and every inch of the Play:5 is there for a reason. It can be orientated in three ways – horizontally or vertically either way up. This means the design has to work across all orientations and, as a result, it leans more towards the more simplistic styling of the Sonos Play:3. This gives it greater flexibility for placement as well as a more ‘natural’ look when used in a stereo pair. Though technology tends to get smaller and thinner with every iteration, this Play:5 went the other way. It’s probably around the same width and height as the original, but is noticeably thicker – and for good reason. The original Play:5 had a bass port on the back, which helped enhance the bottom end while keeping it as slim as possible. However, this meant sacrifices too – it couldn’t go as deep as Sonos wanted and was at risk of port chuffing at certain frequencies. For the replacement, Sonos lost the port and went for a sealed architecture, increasing the acoustic volume to allow it to go louder and lower in the bass. 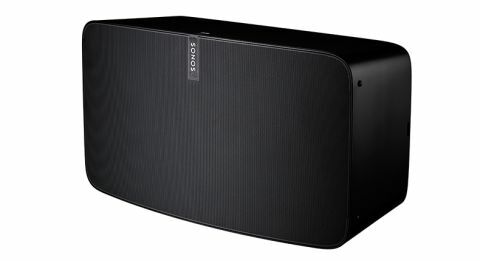 Sonos says the Play:5 is capable of deeper, cleaner bass than even the Playbar – quite an achievement for a product around one-third of the size. The front grille is made out of plastic rather than metal – a process that extended the production by a year. In the original Play:5, the antennas were in the plastic base, but that wasn’t an option for its successor, so the six antennas (positioned for every possible orientation) had to be placed within the main body. A metal design proved impossible without affecting the wireless performance, so the design team devised an Audiofoil polycarbonate grille. At the time, Sonos claimed the new Play:5 offered the best wireless performance it had ever produced and, while it’s presumably now been surpassed by the likes of the PlayBase, we’ve found no fault in the Play:5 in the three years we’ve been using it. The second-generation Play:5 was the point at which Sonos lost the physical buttons, replacing them with touch controls that you’ll now find on many of the company’s products. There are controls for play/pause and volume up/down, as well as the ability to swipe left and right to change track. The volume and track controls alter depending on the speaker orientation, and while you’re more likely to do most of the controlling with your phone or tablet, the interface is responsive, with subtle tones that sound when your touch is acknowledged. The only physical button you’ll find on the current Play:5 is the sync button on the back, which sits alongside the ethernet port and a 3.5mm aux-in. Even the power cord was tweaked and designed in-house. Not only does the Play:5’s only wire look rather stylish by the standards of such things, it’s also a more environmentally-friendly, PVC and halogen-free cable too. Sonos has tweaked its software over the couple of years since the second-gen Play:5 release, but set-up is as simple as ever. The Sonos app walks you through the initial process and adding further Sonos speakers is just as simple: just click in the app to add a new speaker, press the sync button on the back and it’s all done. It’s still the slickest multi-room set-up going. With the introduction of the current Play:5 came Trueplay, Sonos’s audio optimisation software. Trueplay uses the microphone in your iPhone, iPad or iPod touch (Android devices aren’t currently supported) to measure the response of the speaker in your room and tweak its sound to suit. It takes only a minute or so to do and is quite effective (read more about Trueplay in our separate feature). In our dedicated listening room, it does little to the sound, but move the speaker to a less ideal location – a kitchen or a corner for example – and the difference is audible. It tightens up any boomy bass, adds clarity to the midrange and really cleans up the sound from top to bottom. MORE: Sonos Trueplay – What is it? How can you use it? After running Trueplay once, you can toggle it on and off in the settings, as well as further tweaking your speaker to your tastes. We’d recommend giving it a go, particularly the Loudness function, which adds scale and weight but can result in a little lost clarity and cleanliness. You’ll do much of your controlling via the app, with the ability to add your streaming services of choice, as well as search out music saved on the local network. The breadth of Sonos’ streaming service support remains one of its greatest strengths (all of the big ones and many niche alternatives are on board), but just as key to the system’s success is the universal search function, which brings in results from all services you subscribe to and any network shares in the house. You can then build playlists and on-the-fly queues using tracks from any of these sources, with no barriers or distinctions between your music and that being streamed from the cloud. The result is a feeling of real musical freedom. A highlight of the Play:5 is its ability to fill even the biggest room with a rich, powerful sound. Much of that is a result of the driver set-up, with six matching Class D amplifiers and almost three times the acoustic horsepower of its predecessor. Along the bottom, there are three custom-designed 10cm mid-woofers, which are bigger and more powerful versions of those found in the Play:1, alongside three tweeters along the top. The left and right tweeters are in horns, directed out to the side to help give a wider sound. These measure 20mm, while the central tweeter is slightly bigger at 23mm. Some of the extra acoustic power here is used to create a speaker array, similar to that used in the Playbar, to help give a wide sound from a single box. MORE: Which Sonos speaker is best for you? The result is unquestionable – this is a speaker that could fill even the biggest room of the house, and yet for a single box it sounds huge. The ability to go loud (and we mean loud) helps, but there’s so much space to the presentation that even at lower volumes this sounds like a much bigger speaker than it is. Play The Weeknd’s Earned It and the Play:5’s command over dynamics is clear. The dramatic strings intro, punctuated with sudden drum strokes is delivered with both fluidity and punch, rising and falling on queue with timing that’s on point. It’s a lively, energetic sound, and a forgiving one at that. Although you might get a touch more insight and subtlety from some rivals, it’s more forgiving of the relative shortcomings of low bitrate Spotify tracks. A good move considering streaming lies at the heart of the Sonos experience. That’s not to say the Play:5 isn’t capable of plenty of detail. Play Diana Krall’s Peel Me a Grape and the soulful vocal is articulate, richly textured and full of sass. There is clarity in the midrange no matter what you play, which ensures vocals are always pushed to the front of a mix and never overshadowed. This is one area that proved a real improvement over the previous generation, where vocals could get mixed up in a busy arrangement and lose their clout. Another huge improvement is in the bass. The original Play:5 wasn’t lacking for its size, but not only is there more of it, but it’s deeper and more refined. You can add a sub should you wish, but we don’t see why you’d ever need to without a serious grudge against your neighbours. The sub bass intro to A$AP Rocky’s L$D is enough to challenge any speaker, but the Play:5 handles it. Even at high volumes it keeps a lid on things, never sounding loose or flabby. Similarly with Drake’s Hotline Bling, where the original Play:5 struggled to deliver a clean bass line, the current model is clean and solid. There’s no doubt it creates a wonderfully rich sound, but there may be a touch too much bass for neutral ears. Luckily, EQ settings can put this right – we found turning it a notch or two down helped make it more tonally balanced. The top end is rolled off just slightly, but this helps with its forgiving sound, ensuring nothing sounds hard or harsh. Straight out of the box, you might find certain frequencies a bit sharp, so give it a few hours of running in to get to its best. Make the move to stereo (with a second unit) and the sound is even bigger, with a solid stereo image. You can choose to place them horizontally or vertically in this arrangement, and while horizontally will certainly offer a wider sound, we preferred it when vertical. In stereo, you notice an improvement in dynamics, with the added power to get behind the peaks and troughs in dramatic orchestral productions, like Hans Zimmer’s Gotham’s Reckoning. That rich bass response is even more emphasised in this set-up though, so you may find a visit to the EQ settings might be necessary to level things out to a more neutral playing ground. But the Sonos Play:5 now has a problem (and its rivals too, for that matter) that it didn’t when we first reviewed it: the Audio Pro Addon C10. This, the biggest speaker in Audio Pro’s new multi-room range, might lack the technological sophistication and room-filling scale of the Play:5, but for punch, detail and dynamics it’s the better listen. For £200 less, it’s simply too good value to ignore. Sonos still has many advantages over Audio Pro, from the breadth of its range to the flawless app and thorough feature set (hi-res support notwithstanding). If you want a complete, substantial multi-room system, there’s a strong case to choose the old hand over the young buck. In fact, that’s probably what we’d recommend. But, viewed as a wireless speaker in its own right, it’s impossible to deny that the Play:5 can now be beaten for sound quality, not just by the more affordable Audio Pro Addon C10, but also by the more expensive Bluesound Pulse 2. Despite the multi-room system, of which the Play:5 is an integral part, remaining our favourite, the result is a lost star for Sonos’s flagship speaker.